Designer, artist and founder of SMAY Design, Phil Yarnall, knew from the first time he listened to the Clash’s London Calling that he wanted to design album covers. Twenty or so years later his designs range from The Velvet Underground and Jimi Hendrix to Ween and ACDC. Yarnall’s workspace is like an oddity museum with piles of visual artifacts including vintage album art, shrunken heads and other weirdness. Always playing, his personal soundtrack includes music from Elmore James and Funkadellic to the Ramones and The Replacements. Additionally, his collection of vintage Wacky Packages, MAD Magazines, 60′s psychedelia posters, vintage girly magazines, street graffiti and his kids’ drawings all combine to fuel Yarnall’s creative mojo. 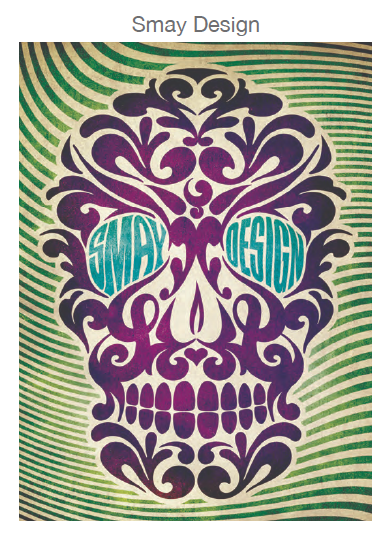 SMAY DESIGN is part of the 20th Anniversary of The Alternative Pick :: Deck Edition. 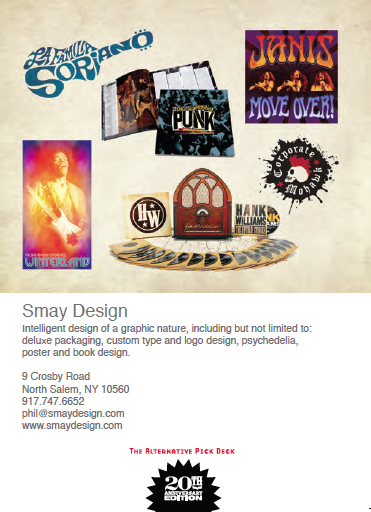 To see more of Smay’s work go to his website and Altpick page. This entry was posted in Altpick, Art, Design, Illustrations and tagged design, found imagery, graffiti, MAD Magazine, music, Phil Yarnall, psychedelia posters, punk, rock & roll, Smay Design, vintage magazines. Bookmark the permalink.